Is Your Community Association Filing The Proper Tax Return? As Donna points out, most board members are not all likely to understand the complexities of accounting principles. And most likely do not understand the complexities of tax issues, returns, etc. as the same applies to their homeowners association. This means that board members do need to hire a competent accounting professional to assist their community. 90% of community associations file the one-page federal 1120-H return, which is the easiest form to prepare for condominiums and HOAs. 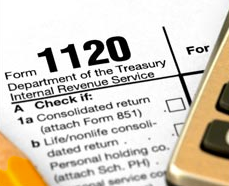 The 1120 return is a more complicated form and is, at a minimum, a five-page return which carries greater risk. Many board members do not understand what income is taxable. Actually, all income the association receives may be taxable if the association does not make an election on what to do with excess income over expenses. But for the most part, all assessment monies, the fees paid by the owners, are tax exempt. According to Donna, “the tax treatment of reserve funds has some interesting nuances. Capital reserves are not taxable. A classic example of a capital reserve would be a roof reserve, as it adheres to the structure. Non-capital reserves, on the other hand, are taxable. A painting reserve and a hurricane deductible reserve are two examples of non-capital reserves. If you pool capital reserves (i.e. roof reserve) with non-capital reserves (i.e. painting reserve) then all of the reserves will be treated as non-capital reserves. Pooling reserves are a big no-no for commercial condominiums as far as taxes are concerned.” I have not heard this before, and if you are a CPA or have expertise in this area, I would like to hear what you have to say about taxation of capital versus non-capital reserves. The fact is that in California, I do not believe that community associations do not make this kind of distinction in how an association allocates reserves. •	Commercial Condominiums •	Condominium Hotels •	Cooperative associations (they must file an 1120-C form). •	85% of the units must be residential in nature. •	60% of the association’s income must be derived from assessments. Donna points out that there are penalties that may be imposed on an association that fails to file the proper tax return. So it is important for community associations to retain a qualified CPA that has worked with and understands the Internal Revenue Code in this area. Got questions? Please contact your association’s accountant, as I cannot answer them.